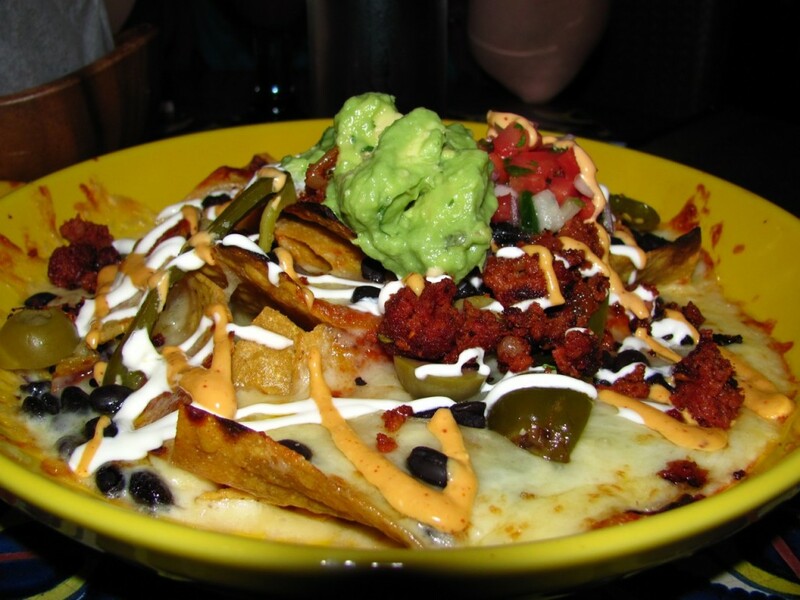 We ordered the Chicken Nachos to start and found ourselves pleasantly surprised by the combination of flavors. They used Chihuahua cheese (also sometimes called queso menonita) that was super rich and creamy, which kept all the nachos together nicely without making them soggy (soggy nachos are my pet peeve!). The nachos were topped with pico de gallo, a generous scoop of guacamole, and a drizzling of sour cream. But my favorite part of the nachos was the herb-pickled jalapeños, which had a really unique flavor when tasted on their own and added a great spicy kick to the dish overall (spice haters you’ve been warned). For our entree we decided to order two different types of tacos and share…we weren’t terribly hungry since our stomachs were still digesting our 5 O’clock breakfast. Each order came with two soft-shelled tacos so sharing was easy. First we had a Chorizo Taco, which had chipotle potatoes, salsa ranchera, queso blanco, and black beans. This one was undoubtedly our favorite of the two, and the flavors closely resembled those of Indian cuisine, almost like a samosa. It was unusual and unexpected but none-the-less delicious. Then we started on our Short Rib Tacos, which were simply prepared with pico de gallo and a tamarind-pasilla sauce. The meat was really tender and good, but not as interesting as the flavors of the chorizo taco. I must warn you though that the tacos were not, I repeat NOT, entrée-sized portions. They were more like tapas…I’m talking three bites and it’s gone!! Thankfully the nachos were rich and of a decent size so we left the restaurant satisfied, but we both agreed that the tacos, which ranged from $8-$10, were over priced for such a small amount of food. Overall, I would go back but only when I’m looking to have a light meal. I normally associate Mexican food with a full feeling afterwards thanks to Chipotle, which I love—I know it’s a chain, but I do love it—and Mxco did not have the portions to satisfy a hungry belly with just one entrée. However, the unique flavors were refreshing and all the ingredients were of high quality. I can only hope the service is better when they aren’t focused on closing at the end of the night.